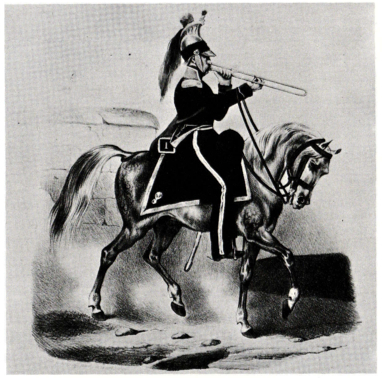 Added another Belgian military trombone image (Madou, 1832) to the 19th century timeline (1st half). It’s shown below, along with the other entries from the timeline related to Belgian military trombonists. There are 4 images total, all of them from the first half of the century and all showing rear-facing trombones. 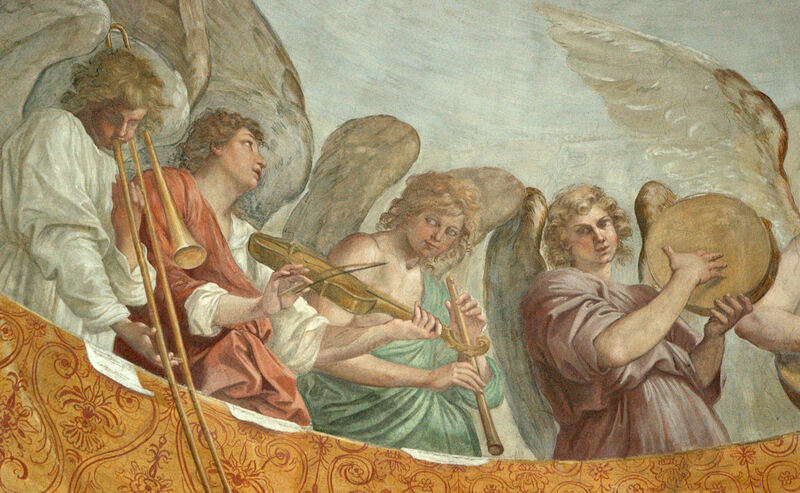 An interesting little slice of the history of the trombone. 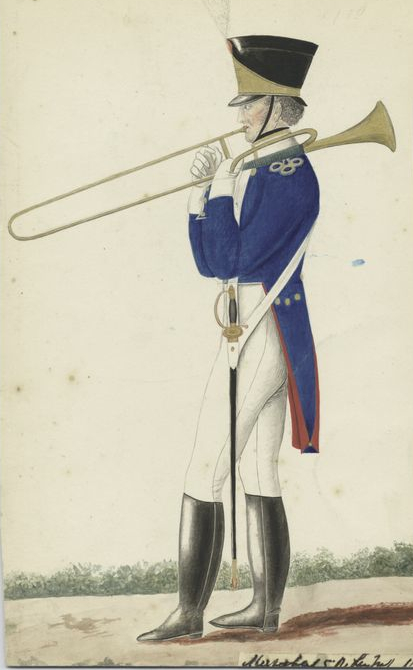 1824—Belgium: A pen and ink drawing of a Belgian military trombonist depicts a player in full military regalia with a rear-facing trombone (see below image; public domain) (New York Public Library Digital Gallery). 1825—Belgium: Sir George Smart, a British traveler, observes, “We heard a very good military horse band which was all trumpets, bugles and tromboni” (Smart 66). 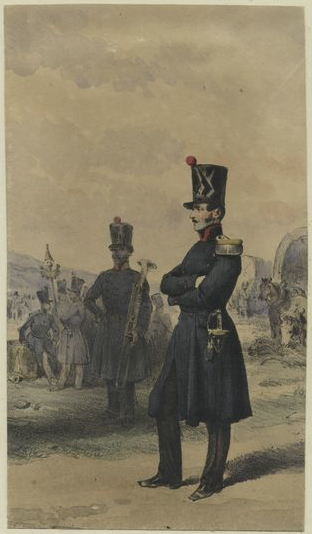 1831—Belgium: A lithograph titled Musiciens d’infanterie belge, or “Belgian infantry musicians,” portrays a musician holding what appears to be a rear-facing trombone (see below image; public domain) (Bibliotheque royale Albert I; Wangermée vol. 2, 264). 1832—Belgium: A print by Belgian artist Jean-Baptiste Madou titled Officier Garde Civique Premier depicts an officer of the Belgian Civil Guard. 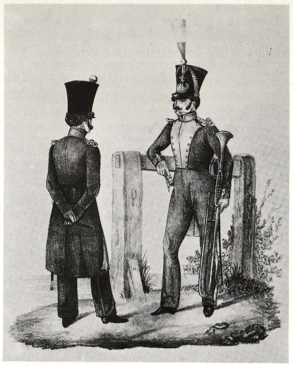 Behind the officer stands a military musician who appears to be holding a rear-facing trombone (see below image; public domain) (New York Public Library Digital Gallery). For a similar image, see 1831 (above). c. 1850—Brussels, Belgium: Musicien et trompette de cuirassiers, a lithograph by Henri Hendrickx, portrays a Belgian infantry musician playing on what may be a rear-facing trombone, the bell obscured by the player’s helmet (see below image; public domain) (Bibliotheque royale Albert I; Wangermée vol. 2, 263).